In 2003, researchers with the Minnesota Department of Natural Resources (DNR) completed a new classification of the native vegetation of Minnesota, Minnesota's Native Plant Community Classification (Version 2.0). The DNR's new classification is intended to provide a framework and common language for improving our ability to manage vegetation, survey natural areas for biodiversity conservation, identify research needs, and promote study and appreciation of native vegetation in Minnesota. Click on topic below to reveal more information. Click again to hide. Version 2.0 of the DNR's native plant community classification is based strongly on plant species composition and was developed through analysis of extensive field data collected from sample plots in forests, prairies, wetlands, and other habitats. 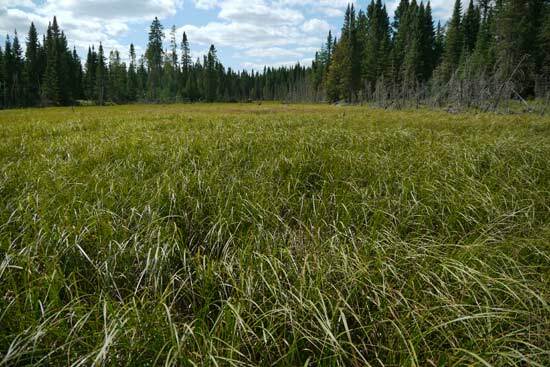 The process and methods used to develop the classification are described in Minnesota's Native Plant Community Classification: A Statewide Classification of Terrestrial and Wetland Vegetation Based on Numerical Analysis of Plot Data (2.1mb). The classification is hierarchical, with vegetation units described at levels ranging from broad landscape-scale ecological systems to local communities. One of the most important features of the new classification is the inclusion of ecological processes as an organizing principle. The development of Version 2.0 of the DNR's native plant community classification was made possible by the acquisition of new data and information gathered through several projects between 1990 and 2000, including development by the DNR's Division of Forestry of an Ecological Land Classification for Minnesota, which provided an organizing framework for the classification; continued progress of the Minnesota Biological Survey in east-central, southeastern, and northeastern Minnesota; computerization of Public Land Survey (1847-1908) bearing tree data and line survey notes, which increased our understanding of pre-European settlement vegetation patterns in Minnesota; and extensive collection of vegetation plot data in Minnesota through the efforts of the DNR, federal agencies, colleges and universities, tribal agencies, and private organizations. The new classification replaces the DNR's previous plant community classification, which is described in Minnesota's Native Vegetation: A Key to Natural Communities (Version 1.5) . The hierarchical construction of the new plant community classification and its linkage to ecological map units are specifically designed to meet the needs of land managers, field surveyors, and researchers working at a variety of scales. The classification has six levels. System groups, the highest level, were created to allow development of manageable field keys for lower levels of the classification. System groups were formed by combining lower levels of the classification along major physiognomic and hydrologic splits in vegetation. Ecological systems, the next level are groups of native plant communities unified by strong influence from a major ecological process or set of processes, especially nutrient cycling and natural disturbances. Floristic regions are divisions within ecological systems that reflect the distribution of Minnesota's plant species into characteristically northern, northwestern, central, and southern groups, or floras. The important influences on these species distributions appear to be climate and paleohistory. Native plant community classes are units of vegetation that generally have uniform soil texture, soil moisture, soil nutrients, topography, and disturbance regimes. For wooded vegetation, native plant community classes were developed by emphasizing understory vegetation more than canopy trees, under the hypothesis that in much of Minnesota understory plants are often more strongly tied to local habitat conditions (such as levels of nutrients and moisture) than are canopy trees. Native plant community types are defined by dominant canopy trees, variation in substrate, or fine-scale differences in environmental factors such as moisture or nutrients. Type distinctions were also made to describe geographic patterns within a class. Native plant community subtypes are based on finer distinctions in canopy composition, substrates, or other environmental factors. In some instances, subtypes represent apparent trends within a type for which more study and collection of data are needed. In other instances subtypes are well-documented, fine-scale units of vegetation that are useful for work such as rare plant habitat surveys. A complete list (23KB) is available for all system groups, ecological systems, native plant community classes, types, and subtypes in the classification. The new classification serves as the foundation for three regional DNR field guides to the native plant communities of Minnesota: The Laurentian Mixed Forest Province, The Eastern Broadleaf Forest Province, and The Prairie Parkland and Tallgrass Aspen Parklands Provinces. Each field guide contains keys to the identification of native plant communities, summaries of ecological systems identified in the classification, and fact sheets with information on plant community composition and structure, soils and landscape setting, and natural history. The field guides are intended for anyone interested in the variety and ecology of Minnesota's native vegetation. They can be purchased from Minnesota's Bookstore. Ecological system summaries and native plant community fact sheets from the field guides are available through links provided below. Ecological system summaries feature information on the fifteen ecological systems recognized in the DNR's native plant community classification. Each system summary contains a brief description of the system, a discussion of the major ecological processes that influence the system, some of the characteristic plant adaptations to these processes, and information on distinctions between the floristic regions in the system. There are three different summaries for each ecological system. Each version is tailored to describe the system as it occurs in either the Laurentian Mixed Forest Province, Eastern Broadleaf Forest Province, or Prairie Parkland and Tallgrass Aspen Parklands provinces, respectively. Although the three versions differ somewhat in content, there is much overlap. The summaries available through the links below in the green box are reproduced in the form in which they originally appeared in the native plant community field guides. For more information on interpreting the system summaries, please see User's Guide to Ecological System Summaries . Each native plant community class, type, and subtype is given a unique code to aid in native plant community data management and map labeling. Please see Explanation of Native Plant Community Names and Codes for information on the codes and on plant community names. Each of the native plant community types and subtypes has been assigned a conservation status rank (S-Rank) that reflects the relative rarity and endangerment of the community in Minnesota. Further information may be found in Conservation Status Ranks for Native Plant Community Types and Subtypes (145 kb), which also includes an explanation of the rankings. Condition Ranks for native plant communities reflect the degree of ecological integrity of a specific occurrence of a native plant community. Condition Ranks are assigned by considering species composition, vegetation structure, ecological processes and functions, level of human disturbance, presence of exotic species, and other factors. Several other useful sources of information on native plant communities in Minnesota are: Natural Vegetation of Minnesota at the Time of the Public Land Survey 1847-1907 (1988) ; Minnesota's Natural Heritage: An Ecological Perspective, by John Tester (Purchase from Minnesota's Bookstore) ; and Minnesota's St. Croix River Valley and Anoka Sandplain: A Guide to Native Habitats, by Daniel Wovcha, Barbara Delaney, and Gerda Nordquist (out of print, but possibly available in local libraries or for purchase through the University of Minnesota Press) .